It is this last and most worthy goal to which artists like James Dietz aspire. In his portrait of events in the 20th and 21st Centuries, he labors to achieve that rare combination of historical fact and the romance, adventure and color of fiction. By 1978, Jim and his wife had moved to Seattle, where Jim’s work gradually shifted away from commercial illustration to primarily historical aviation, automotive and military art. Today his work is internationally known and collected, and his style, with its emphasis on depth of story, is recognized by collectors of historical art. His list of clients includes: Boeing, Bell Helicopter, Federal Express, Allison, Cessna, Flying Tigers, the Indianapolis 500, BMW, the National Guard and many U.S. Army associations: U.S. Army Rangers, 82nd Airborne, 3rd Division, 4th Division, 29th Division, First Division, 1st Cavalry, 11th Cavalry, 28th Division, 41st Division and 37th Division, Command General Staff College, Army War College, US Air Force Documentary Art Program, Wingnut Studios, Meadowbrook and Pebble Beach Concours d’Elegance . 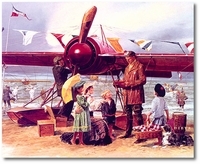 Jim has been a member of the World War I Aviation Historical Hall of Fame, an Artist Fellow of the American Society of Aviation Artists and a board member of the Automotive Fine Artists of America. He had one-man shows at the Experimental Aircraft Association (EAA) Museum in Oshkosh, Wisconsin in 1990, 1998 and 2003; San Diego Air & Space Museum in 1990; and the US Air Force Museum at Wright Patterson Air Force Base in 2003. His paintings are part of the permanent collections of many military museums around the country, including the Pentagon, the San Diego Air & Space Museum, Pensacola Naval Aviation Museum, Special Forces Museum, 82nd Airborne Museum, and the Smithsonian Air & Space Museum. 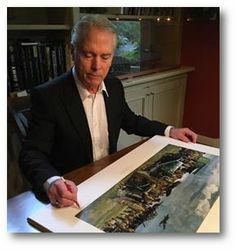 In 2001, Barnes & Noble Publishing released a book on Jim’s World War II art, entitled Portraits of Combat. In 2005, Jim fulfilled a childhood dream when he got the opportunity for a cameo role in Peter Jackson’s (Lord of the Rings) remake of King Kong. Jim plays the role of pilot of the Curtis Helldiver aircraft which fires at Kong while he is perched high above New York on the Empire State Building. Jim and his wife, Patti, live in Seattle with their dog, Sarah, who shares the distinction with previous Dietz pets, of being a regular in Jim’s paintings. Their son, Ian, is currently an officer serving in the U.S. Army. Jim works in a warm, pleasantly cluttered studio that resembles a WWI aviation bar, surrounded by uniforms, props and models that have made their way into paintings over the years.